Applications: For cleaning, satinising and brushed finishing. Suitable for most metals. 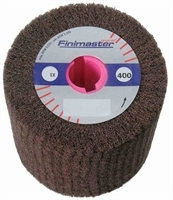 Fits FiniMaster Basic, Poly PTX, Flex LP 1503 and similar machines using 19mm keyway fixing. Product Notes: Use coarser grades (eg 80) for deeper cleaning and very fine grades, eg 400 or 600 for satin finishing. Tex is non-woven abrasive material giving an even, consistent finish. Also Available: We also offer cloth flap, combination, stripping and polishing wheel brushes for these machines.